I grew up a garden kid. Like most garden kids, the bulk of my summer chores involved weeding and helping to process the veggies that grew. The best part of garden work for me was that I got first dibs on the most coveted bites of the harvest - sun-warmed strawberries. Juicy and sweet, they just tasted like summer to me. They still do, and as much as I love late summer watermelon and nectarines, strawberries are still my favorite fruit. Chefs and foodies have always loved strawberries - they know that strawberries practically wave starting flag of the local summer growing season. Strawberries really are the start of something good -- the summer fruit parade that is about to begin! Peak season for strawberries starts in mid-to-late June. Don't even try to talk about fresh strawberries in November. That's like having asparagus at Christmastime - out of season, tasteless, and stringy. It doesn't matter how much chocolate gets poured on strawberries at any other time of year... cold, out-of-season strawberries shipped from halfway around the world taste like nothing -- especially when compared to garden strawberries that have never seen the inside of a refrigerator. Now is the time to get your strawberry shortcake and strawberry pie fix, the local strawberry season is short and oh-so-sweet. One of the best ways to enjoy pure, fresh strawberry flavor is to sit down with a quivering little strawberry gelatin. Refreshing and wobbly, gelatin is a great cooling summer dessert that celebrates fresh fruit at its peak and, better yet, there is no turning on the oven! Far superior (and way more customizable!) than the stuff from a box, gelatin made from scratch is an easy and healthy way to relive comforting childhood dessert memories. Gelatin can be made up to four days in advance and is fat-free, as well as gluten-free. Making real gelatin can be a tad intimidating because it involves an extra step beyond boil water/stir in packet. This step is "blooming" or pre-soaking the gelatin. It is not hard, I promise! Blooming is just a fancy word for softening and it involves mixing the unflavored gelatin with a little cold water for five minutes before mixing in the remaining hot liquid. Extra step? Yes, but totally worth it because it allows the cook to control the amount of sugar and play with the flavors in the dessert. The following strawberry gelatin recipe can be made with a variety of liquids - I have had success with flavored sparkling or seltzer water, sparkling wine, coconut water, green tea, or even almond milk as a base. Choose a drink you love, add a little extra love in the form of flavoring (like vanilla or citrus juice), or some finely chopped herbs (like fresh mint) to add what chefs call "fleckage," and you've got a fancy little gelatin to showcase your favorite berry, whether that be strawberries or something that shows up later in the summer. A combination that I absolutely love is fresh strawberries and basil. It sounds weird at first, I know, since basil has such a strong connotation of pesto, but with strawberries, the sweet side of basil is revealed. 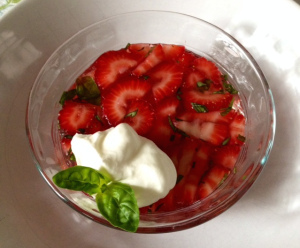 Floral and anise-spicy, basil is a great foil to a strawberry's fragrant sweetness. Fresh mint is a more traditional, yet equally tasty, option for the gelatin. 2. In a small mixing bowl, sprinkle both packets of gelatin over 1/4 cup of the soda water - stir, then let stand for 5 minutes until the gelatin absorbs the liquid and begins to soften or "bloom"
Now is the time to start looking for homegrown strawberries in the markets and grocery stores. The excitement about this early summer delicacy is rivaled in my book only by the appearance of homegrown tomatoes in August... another childhood favorite, best when eaten garden fresh!